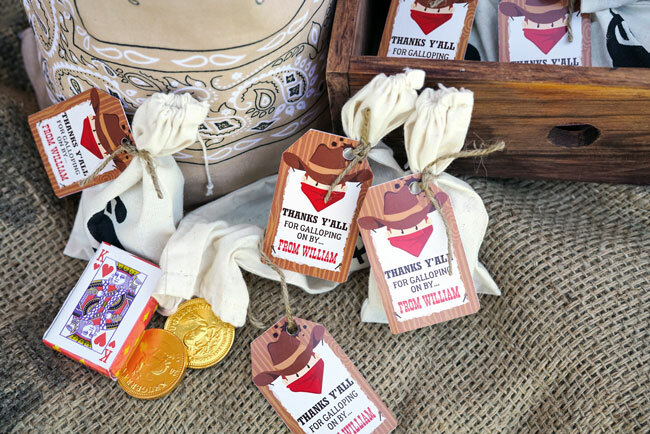 Every little boy deserves one fun Wild West Cowboy Themed Birthday Party during his life and this amazing western theme oozes inspiration! 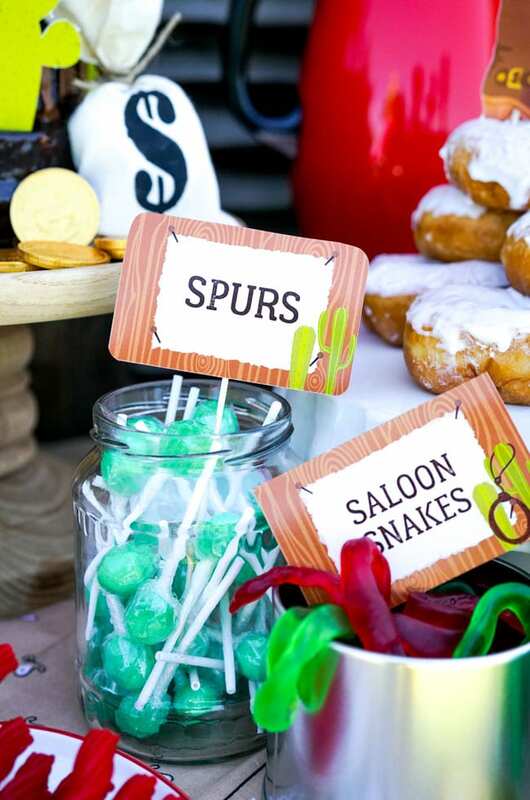 Take a peek at all of the fun and sweet Cowboy themed party ideas. Your cowgirl and cowboy will fall in love as soon as they walk in! And isn’t that the best part, seeing their sweet, excited faces? A cowboy theme party is fun for any age! Whether you’re planning a first birthday or a fifth birthday, an old western theme cowboy party will be a hit! 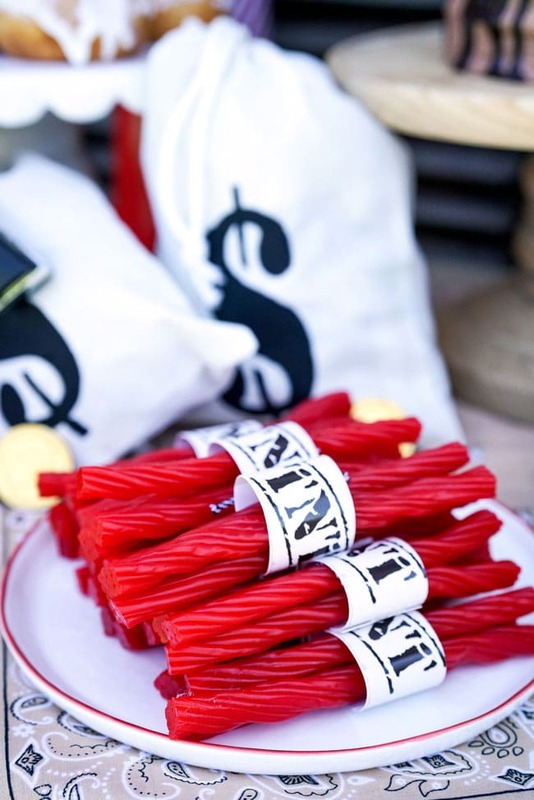 There are so many fun and creative decorations, food and dessert ideas, party favors, games, and more! 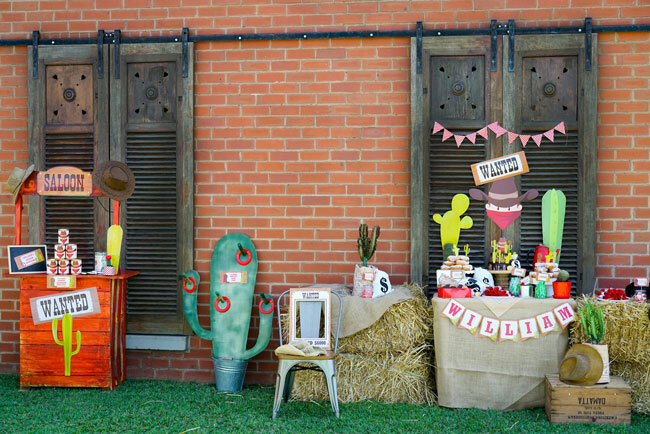 We love how Sunshine Parties incorporates the wooden doors, burlap and hay bales with their adorable cowboy party printables and other cowboy themed decorations. 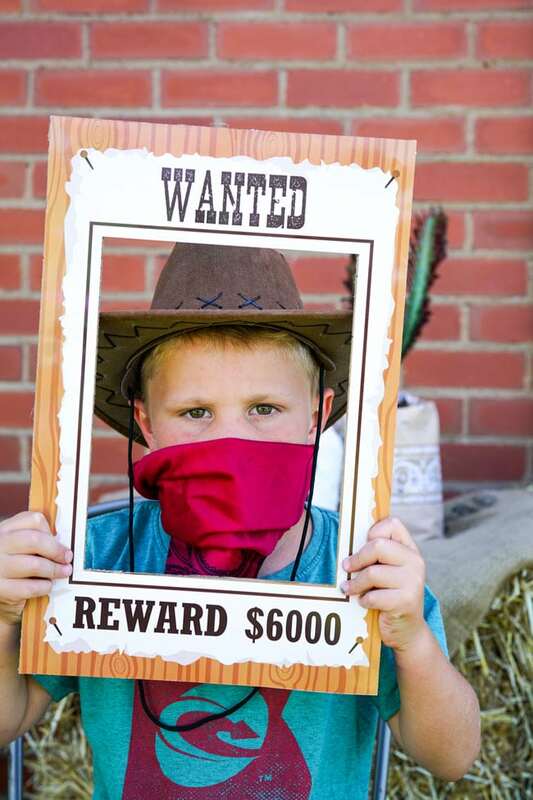 Sunshine Parties did an amazing job creating the perfect Cowboy Theme Party for their little guy’s 6th birthday. What a great job getting ready to roll with this sweet rodeo! And we absolutely adore their cowboy party ideas from the set that they created. You’ll love the ease that it will bring to your party planning. Making memories is the whole reason behind celebrating birthdays! We definitely don’t want to be stressed and worried about spending money on the perfect birthday party, though! 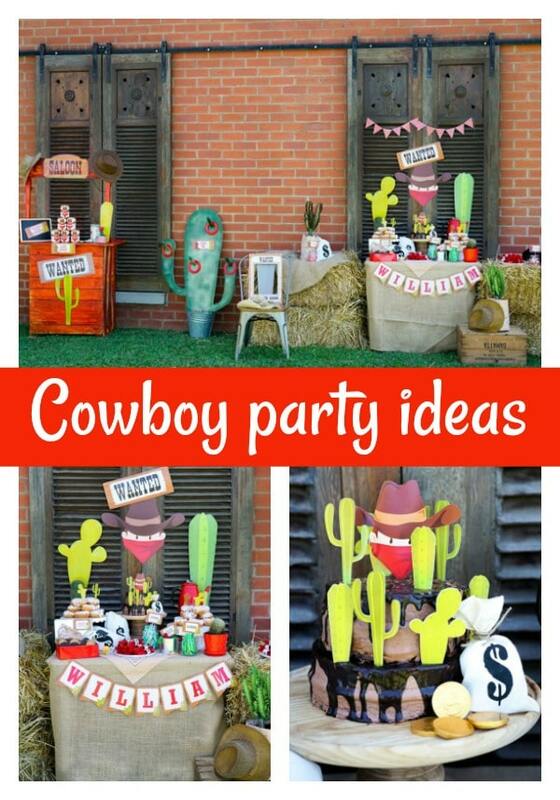 That’s why we just love Sunshine Parties wonderful Cowboy Theme Party printables. 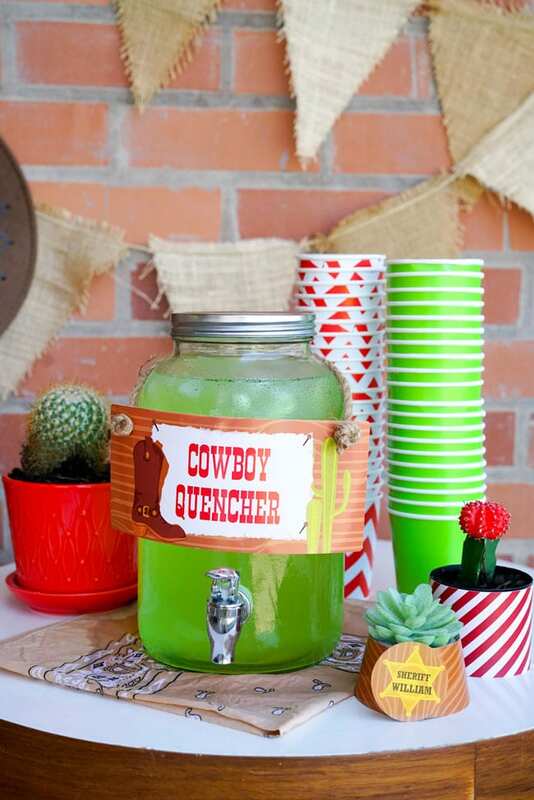 And if you get creative, you don’t have to spend a ton of money to have a Pinterest-worthy Wild West Cowboy Themed Birthday Party for your little one! 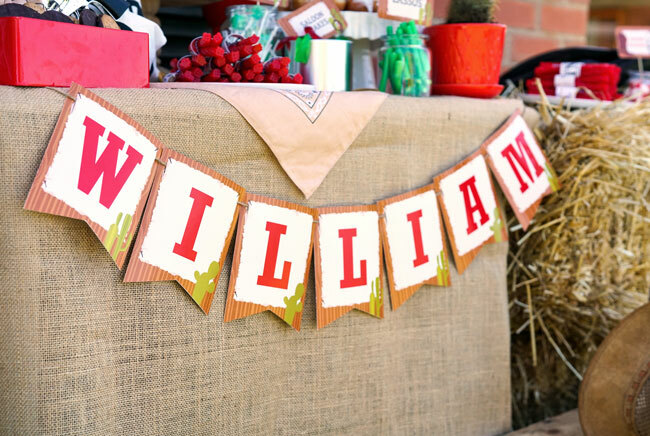 This Cowboy Theme Party was an absolute hoedown to remember for the birthday boy! Cowboy party decorations were created that you can have the luck of editing for your own needs! It doesn’t get any better than that and we love the cowboy decorations that are found all over the party venue. 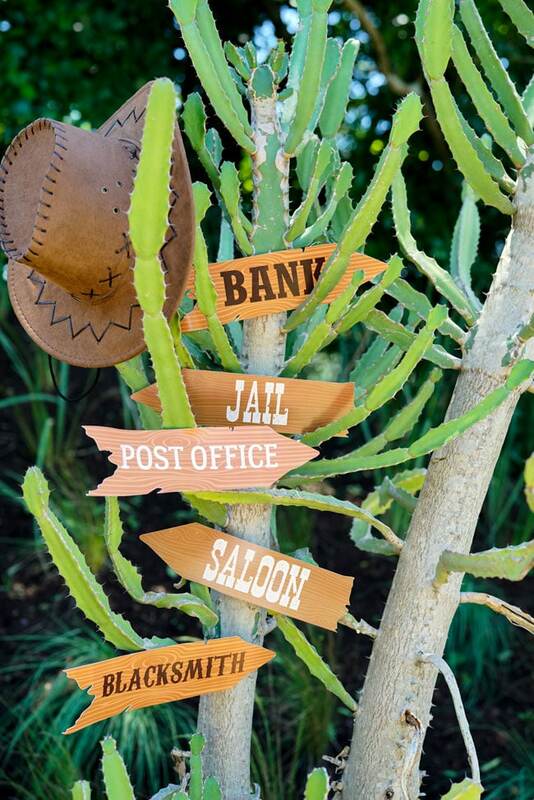 Cowboy and cactus backdrop items matched the party invitation for this Wild West Cowboy Themed Birthday Party. There was also a ‘Wanted’ sign and cool red and cream diagonal stripe mini bunting, along with the main party banner featuring the birthday boy’s name. The banner is totally editable, so could feature a name, ‘Happy Birthday’ or any other message! Just look at the main party table. Sunshine Parties just happened to have these awesome wooden shutters, looking remarkably like saloon doors, and just had to use them! But, if saloon doors are nowhere to be found around your home, fear not! This set-up is so easy you can do it anywhere, indoors or outdoors, against a plain wall or textured wall, it’ll work for you! To bring in the rustic theme, a burlap western table cloth was used, with a paisley print overlay, some hay bales and some cactus plants. And yummy food, of course! Just look at those delicious appetizers ready to be eaten by all of the excited guests! Just using a simple bandana over a white, lace table cover exudes a cowboy theme right away! When creating a table set up, Sunshine Parties recommends just using what you have and borrowing what you don’t! 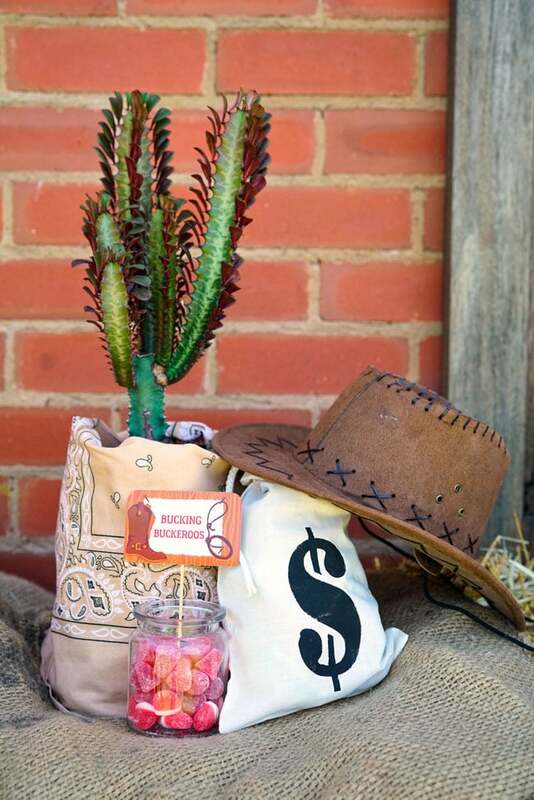 Cactus plants, cowboy hats, cake stands, some hay bales, a saddle and red and white check or paisley fabric all work well for the classic cowboy look. Sunshine Parties luuuuves to label the food and they do a great job coming up with the best names for the party menu! Just check out the fun “Saloon Snakes” ready to be devoured. And we just love the ‘spurs’ that guests can grab quickly, too! 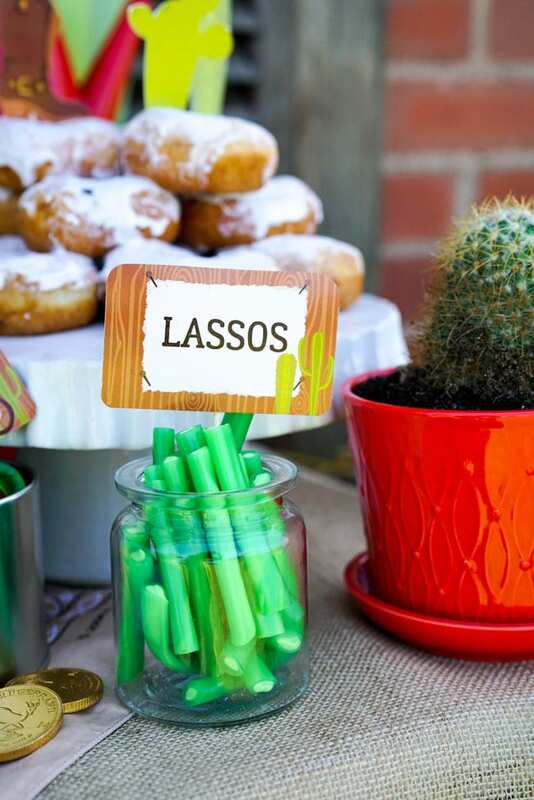 You can’t have a Wild West Cowboy Themed Birthday Party without some ‘lassos’ out and about! 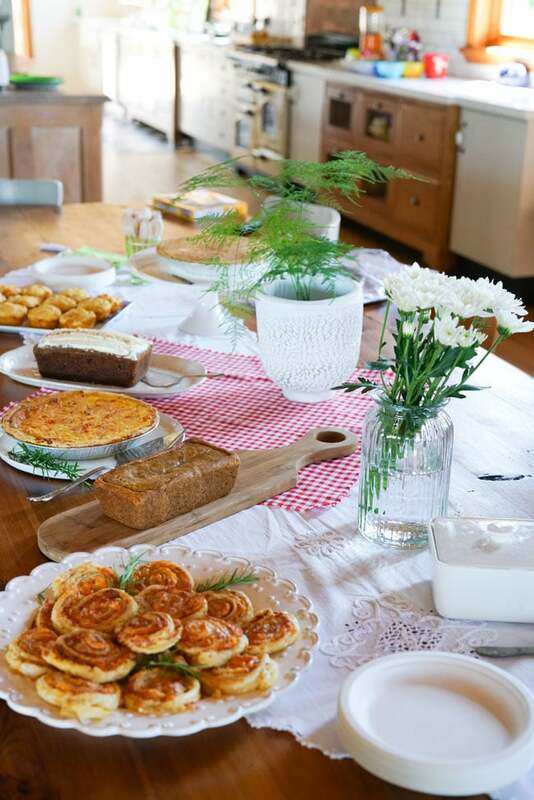 These food ideas are so fun and unique, everyone is going to want to use them for their own Western Theme Party in the future! We aren’t done yet, though! ‘Wagon Wheels’ are a fun, sweet treat for everyone to enjoy, as well! 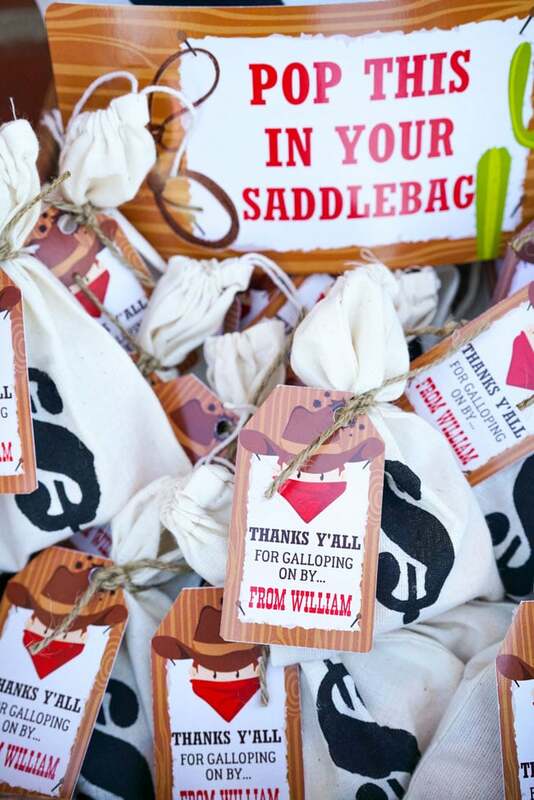 DIY cowboy party decorations are a great way to keep the expenses down, while making it fun and easy for everyone. We definitely love that! And how easy is it to use some red licorice to create ‘TNT’?! All good cowboys need to be prepared in the face of adversity and TNT is always a great way to make sure they are able to accomplish anything that gets in their way! It’s pretty yummy, too! 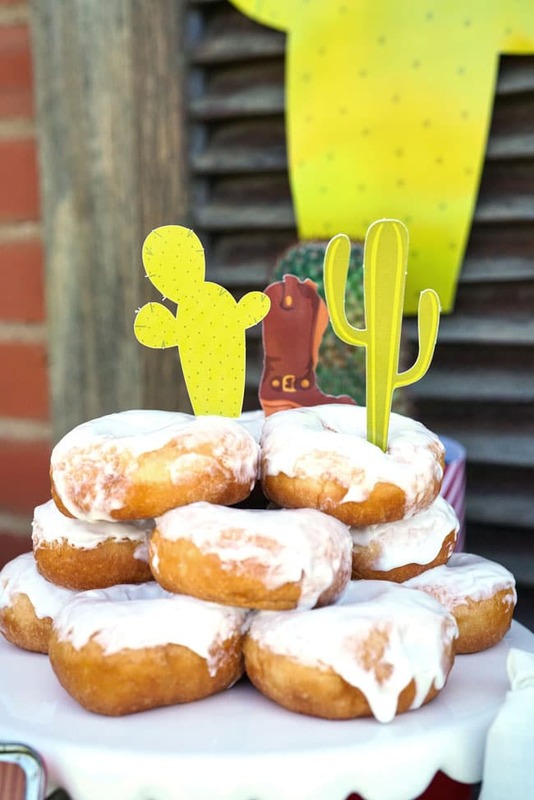 We love the donut creation, adorned with some of the paper cactus’ and boots that are available with the party items for the Cowboy Theme Party. No cowboy worth his spittle would have a party without a dang good slice of cake somewhere in the proceedings! To keep it simple, delicious and effective, a double layer chocolate was created, oozing with delicious chocolate icing. 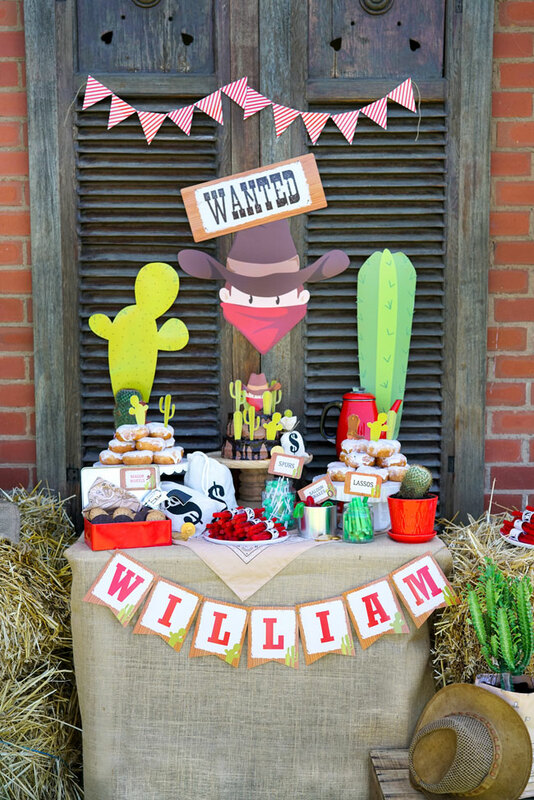 The cowboy motif from this party set up was used and the little cowboy is seen peering out from behind some fearsome cactii! Add in a bag o’ loot and some chocolate coins and … BOOM! It’s the perfect cowboy theme cake! Add a whole lot of fun to your party with editable directional signs! 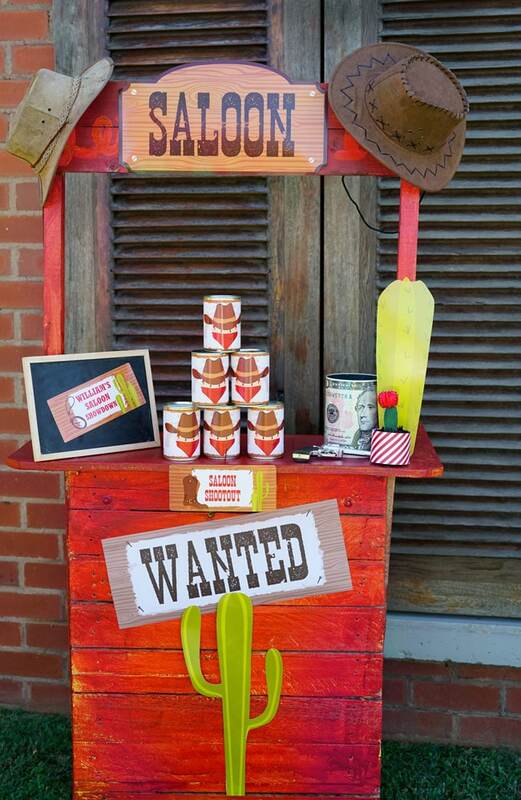 We absolutely adore this feature from the Sunshine Parties cowboy package! 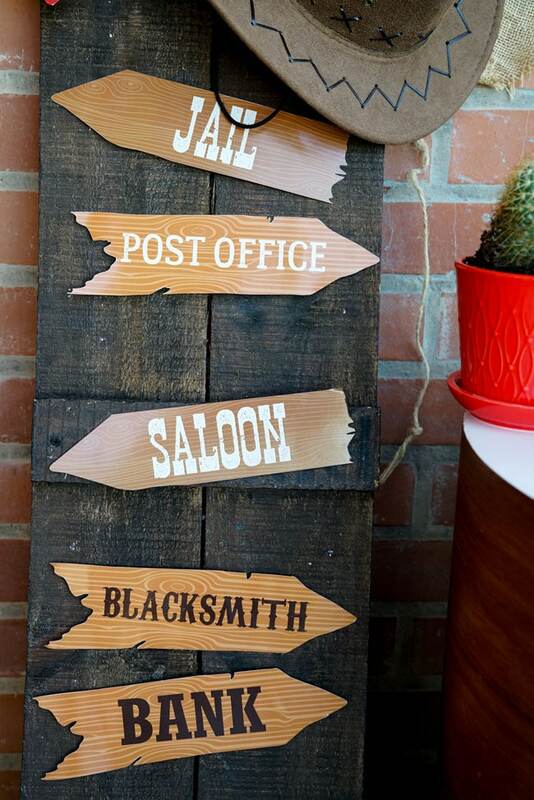 Create any type of directional sign you want that may work the best for your own Cowboy birthday party and BAM … No Stress! Which is exactly the way planning a birthday party should be! A fun DIY cowboy party game was created for the kids. 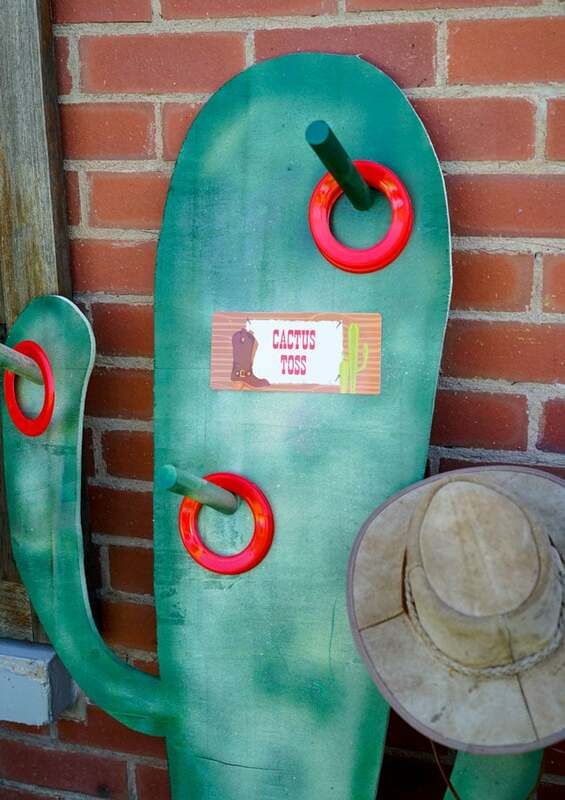 How clever is this ‘Cactus Toss’ game?! The kids will love this simple game and it will be a great addition to the Western Theme Party. 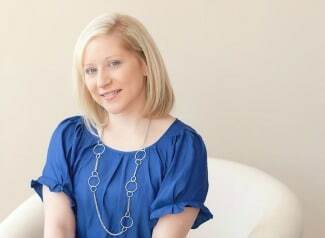 And you’ll love how simple it can be to create something that will be used all day! 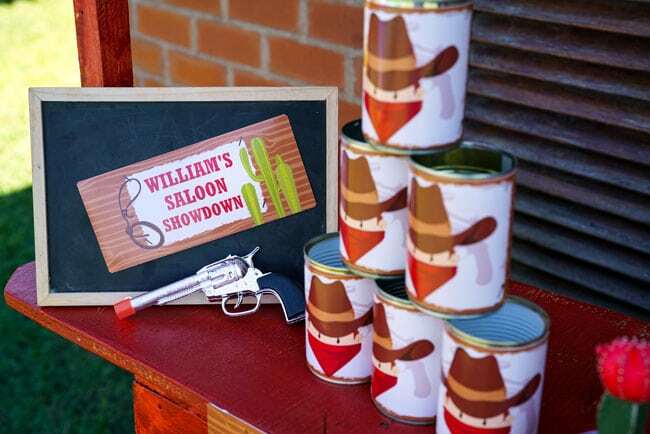 Another Cowboy Theme Party game that was created was the ‘Saloon Showdown’, where the kids knocked over Cowboy Cans. Knock down the most, and you win! Simple, yet effective and the partygoers will absolutely love it! Before you know it, they’ll be wanting to play it over and over and over again! How cute! Sunshine Parties had this lemonade stand from another party, and ‘repurposed’ it by painting it red and slappin’ on a ‘Saloon’ sign! What an amazing addition to a Cowboy birthday party. Throw on some cowboy hats and a cactus sign, and before you know it, you have one of the best focal points of the entire party! No cowboy I know would say ‘No’ to popping a bag of loot in his saddlebag! For the party favors, Sunshine Parties had these cotton drawstring bags made by a local seamstress. Then, they made the dollar sign stencil out of the dollar template in the party set and painted each one on with a small sponge roller. What incredible DIY cowboy party decorations! Inside? A pack o’ mini playing cards and a couple gold (chocolate) coins = very happy little cowboys! If you have it in mind to throw a great cowboy party, don’t be a lone ranger and do it all yourself. Grab the full set here, and mozy on through your party in laid back cowboy style! All thanks to Sunshine Parties! 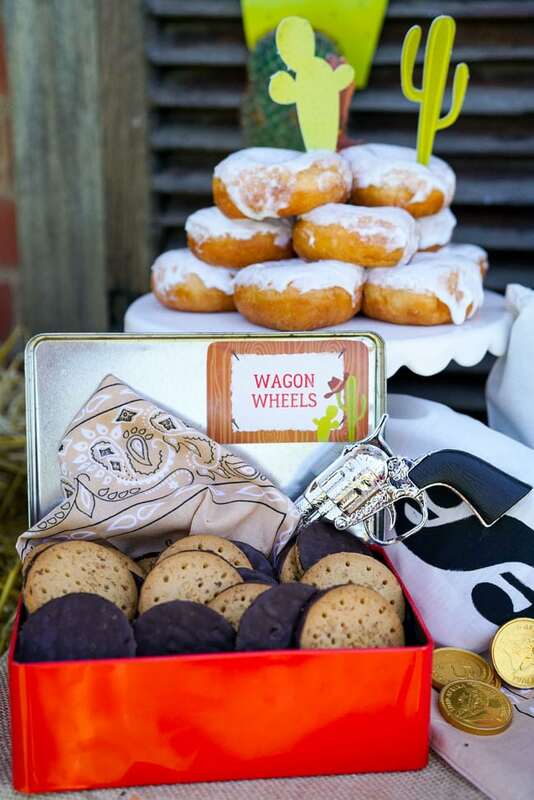 Hi Ho, Hi Ho … it’s off to the next Wild West Cowboy Themed Birthday Party we go! It looks like this little cowboy had himself a great time and made lots of memories that will last a lifetime. These are our favorite kind of photos, where we get to see the pure joy on the birthday boy’s face! Yee haw and we’ll see y’all soon! 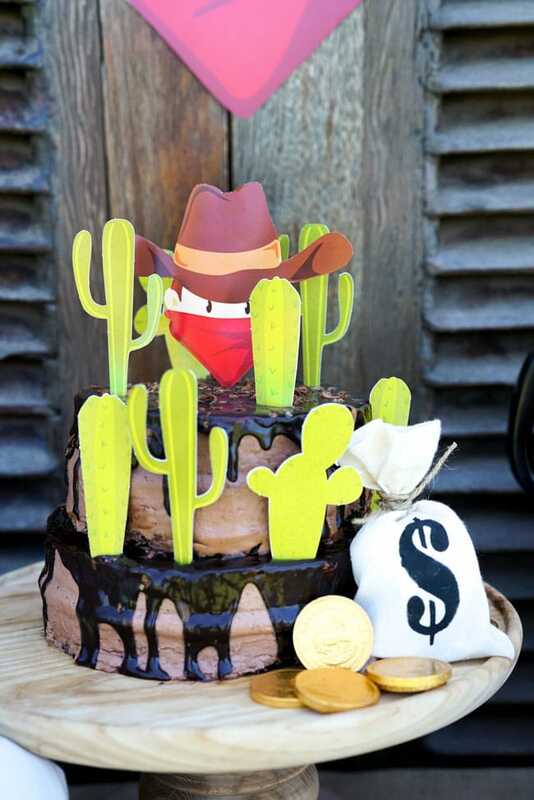 What’s your favorite details in this Wild West Cowboy Themed Birthday Party? Let us know in the comments below! For more party ideas, follow us on Instagram @prettymyparty and Pinterest and join us in our private Facebook group.